In October Leslie Smith Gallery, in cooperation with interior designer Marcel Wolterinck, will be organizing an exhibition on modern Aboriginal Art paintings, called 'Wolterinck Pure Art'. This exhibition will be showing many beautiful pieces of contemporary Aboriginal artists from Australia, which go very well together with the interiors Wolterinck designs. 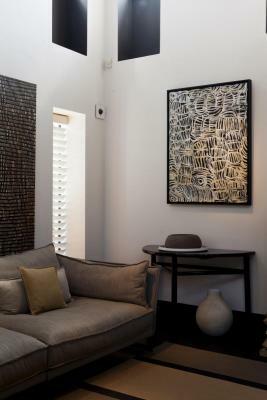 No folkloric art for tourists, but a collection of paintings with a warm and abstract beauty, which matches the symmetric lines, pure materials and colors in the interior designs of Marcel Wolterinck. The festive preview of 'Wolterinck Pure Art' will be taking place at the Wolterinck Store in Laren, Thursday October 11th, 17:00 - 20:00 hours. The whole month of October will be in light of 'Wolterinck Pure Art'. Next to the exhibition, LSG will be organizing several events in the Store in Laren.